BRACEBRIDGE — Worried about the weather out there today? Look around, you may have misplaced a $100,000 lottery ticket sold in Bracebridge last Feb. 14. You have till tomorrow to collect it, or it will be part of more than $25 million uncollected in the $2017-18 OLG fiscal year. Think if you’re sitting on $100,000 and you have to collect it by Valentine’s Day. The clock is ticking; and if you’re down to the final 24 hours, that’s $4,167 an hour to collect it. So, if you’re heading to Toronto today to collect your year-old lotto win, you’d better act fast. Get out the shovel and head south now, because you may not make it on time for 5 p.m. Feb. 14. Then again, you can probably afford to pay a friend to drive or hire a taxi, limo — or even buy yourself a new pickup with a plow on it. A winning ticket worth a hundred grand was bought in Bracebridge Feb. 14, 2018 and never claimed. 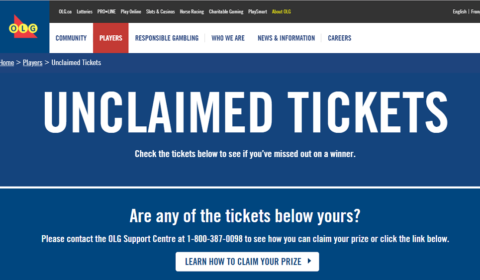 According to Toni Bitonti, senior media relations manager for the Ontario Lottery and Gaming corporation: “While most winners claim their prizes right away, each year a small percentage of all lottery prizes are not claimed. “In our fiscal 2017-18, unclaimed prize value was approximately 1.2% of total prize money available. He says most unclaimed prizes are for small amounts such as a few dollars, and people have likely forgotten to claim their prize. He said: “It’s rare for major prizes ($10,000 or more) to not be claimed. “Saying that, the LOTTO 6/49 $100,000 prize from the Feb 14, 2018 draw has yet to be claimed.